Aedis Real Estate’s shipping container residential project planned for Park Mesa Heights - AEDIS REAL ESTATE GROUP, INC.
Aedis Real Estate Group will build an affordable apartment building in Park Mesa Heights utilizing shipping containers, moving forward with a plan for the low-cost, fast-turnaround construction method. The material has become more popular, particularly as Los Angeles and the state continues to grapple with a shortage of affordable housing. The Laguna Beach developer filed plans with the city for a 98-unit development at 6501 Crenshaw Boulevard, according to Urbanize. It would replace an existing church. The project is called Hope on Hyde Park and is one of three developments currently planned as part of its Hope Street Initiative affordable housing program. Each will be completely permanent supportive housing for the chronically homeless, and will include on-site services. KTGY Architecture + Planning is designing the Hope projects. Their first is slated for Westlake. Aedis hopes to cut down on development time and costs by using steel modular designs built off-site, such as Hope on Hyde Park’s shipping container construction. 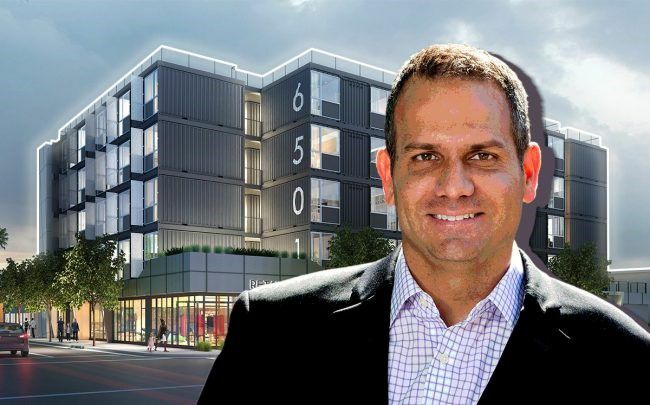 In order to maximize the number of buildable units, Aedis is seeking density bonuses and other incentives through L.A.’s Transit-Oriented Community program, which provides those incentives for building affordable units near transit stations. With close access to a number of bus lines the under-construction Hyde Park Metro station, part of the future Crenshaw/LAX line, Hope on Hyde Park is eligible for the highest bracket of TOC incentives.